We are liberated by God’s grace! 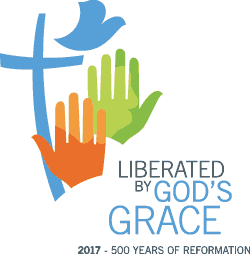 “Liberated by God’s Grace” is the main theme for the LWF's activities around the 500th anniversary of the Reformation in 2017. It will also be the theme of the 2017 Assembly of The Lutheran World Federation (LWF) in Windhoek, Namibia. All our celebrations, worship, study and engagement over the next three years will focus on how the gracious love of God, through the life and ministry of Jesus Christ, opens up opportunities for us as faithful Christians to reach out as healers and reconcilers to a world torn apart by strife and inequality. “Salvation is not for sale” – these words help convey the central message of the doctrine of justification (liberated and justified by God’s grace alone), key to Lutheran theology. As Luther in the 16th century rejected the idea of selling indulgences, a practice that gave the impression that one could buy salvation, today we resist treating salvation as a commodity on the religious market. We say no to theology that promises believers prosperity, something not in keeping with Lutheran understanding of Christ’s sacrifice on the cross. God’s good creation has been entrusted to our care. That is what our Lutheran understanding of God, our theology, tells us. Just as human beings are to be respected and protected, so too should the earth we inhabit. We are not here on the earth to exploit or dominate it for our own ends. Nor are we here to horde, waste or contaminate the earth and its many resources, including life-giving water. We are called to be good stewards of the earth that has been given us. That is why we Lutherans are working for the sustainability of the earth.